I don’t want fig leaf or oak bark infusion. I don’t want gimmicks and royal icing where it’s not needed. I want to explore flour, sugar, butter and eggs. Give me cinnamon. And whole wheat flour. Oats. And dark brown sugar. I want to look underneath a biscuit. And see a golden colour. And little ridges. And above all, I want to build a collection of solid recipes for the years to come. For traditions that don’t exist yet, but will. And for those that are already there. Yes, at times, I love to experience with crazy flavours. The next big thing. Or more. But as I’ve told you yesterday, for me, Christmas is all about rituals and beautiful habits. I hope you feel the same way. 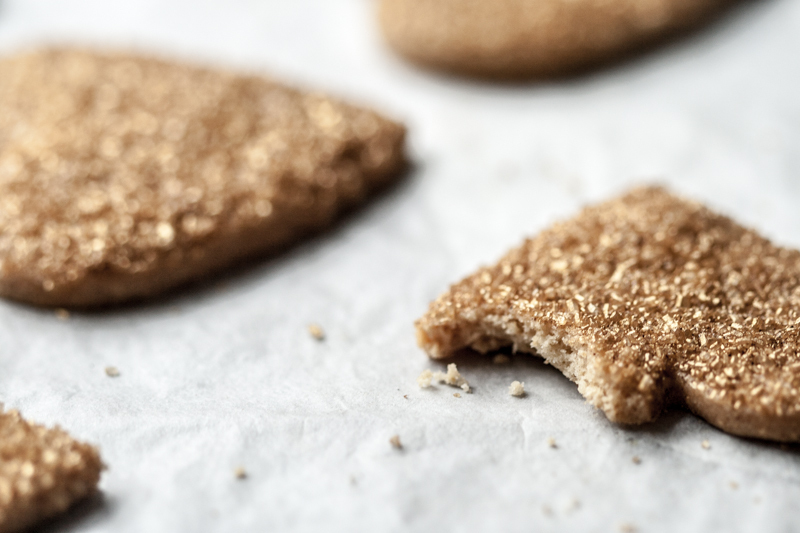 When it comes to a biscuit texture you can get: crisp, crunchy, sandy/short, caky or chewy. These ones are full-on crisp. A beautiful texture which makes them – perhaps – the best biscuits I’ve ever eaten. So much, in fact, that this year, I’ve decided to forgo my usual vanilla shortbreads and use this recipe as a base instead. Maybe try different shapes, perhaps even thumbprint cookies and see how that goes. I think their insane texture comes from the initial sanding technique, when the butter gets rubbed into the flour and sugar, which created beautiful layers within the biscuit. So I might experiment with this instead of the usual creaming that most of my biscuit recipes use. They also make me want to try more of Trine’s recipes. Have you ever? If not, then please, make a batch of these. As I usually do, I rolled the dough between two sheets of baking paper (but as I mentioned yesterday, it makes me miss the feuilles guitare I use at the restaurant, SO. MUCH. BETTER.) as soon as it gets made, and then go on with the chilling. I’ve found that resting the dough before rolling doesn’t improve the texture, and really, makes it so hard to roll that you have to 1) bash it with a rolling pin to make it somewhat workable or 2) let it outside to warm up a bit (hence, erasing all the benefits of keeping the dough cold at all times: making the water content of the butter less available for gluten to bind). Two or three important things though when it comes to rolling the dough. – always roll in different directions. 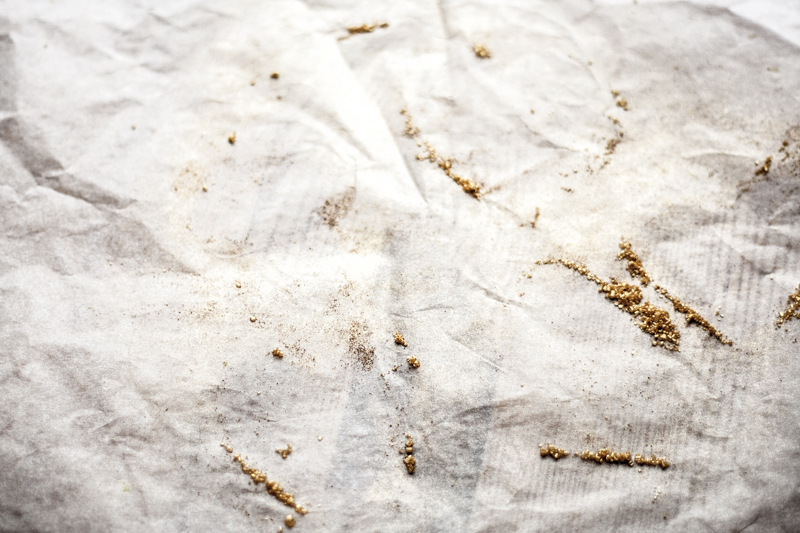 – every now and then, lift the baking paper and smooth any wrinkles out. They tend to make the dough fragile and the biscuits less pretty. 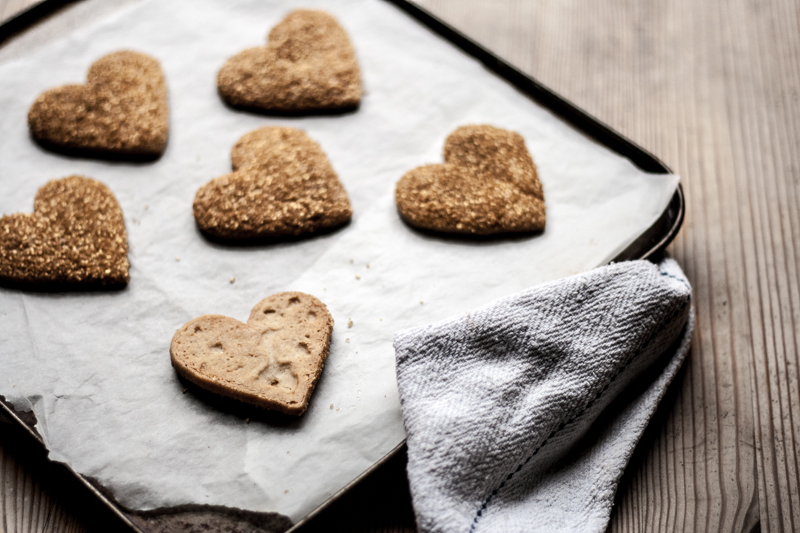 – before you cut out your biscuits, remove the top layer of baking paper, then place it back (it won’t stick as much), before filliping around and removing the second layer of baking paper. This way, as you cut out, the shapes will stay in your cutter, instead of sticking to the paper (hope that makes a semblance of sense at all?!). Also, re-rolling the trimming? I would usually say it’s a big no. But f*ck it, it’s home baking after all. Mix the sugar, cinnamon, and gold shimmer (if using) to combine. 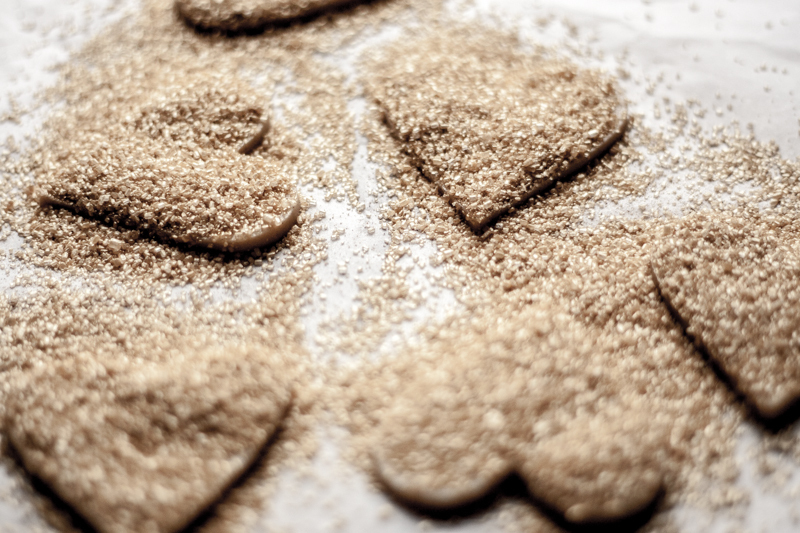 Place the flour, sugar, baking powder, cinnamon and salt in a large bowl, and mix to combine. Add the butter, and rub it in the flour mix until it resembles coarse oats. Add the egg and work the dough until just smooth. Roll the dough between two sheets of baking paper until it’s around 4-5mm thick. Place on a baking tray that fits in your fridge, if the dough is too large, you can cut through the paper to make two or more rectangles. Chill the dough overnight. 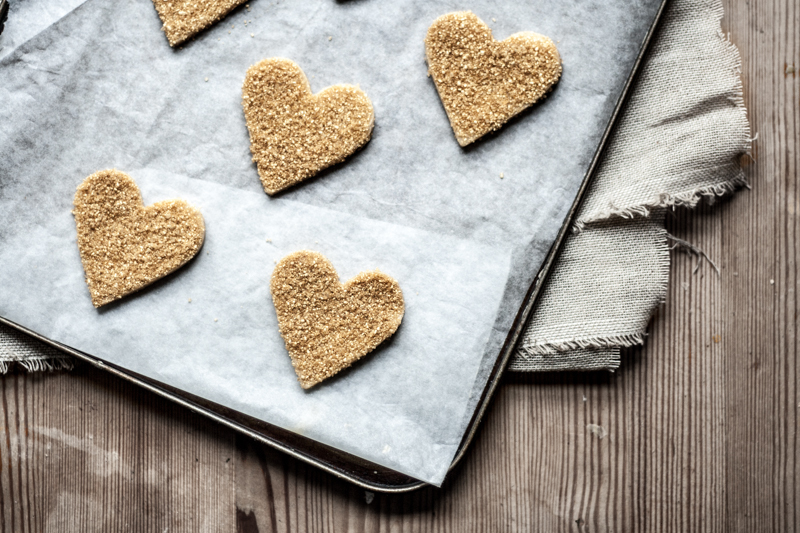 The next day, cut out your biscuits using either a round 5cm cutter or different shapes, and place on a large sheet of baking paper. Brush with the beaten egg and sprinkle generously with the cinnamon sugar. Shake off the excess and place on a baking tray lined with paper. At this point you can either freeze the biscuits for a month or so, or bake them straight away. Preheat the oven to 170°C. Bake the biscuits for 14-18 minutes, depending on their size. They’re ready when evenly brown. Allow to cool down completely and keep in an airtight container. Trine says they’ll keep for a month. If so, my dreams of the perfect biscuit have come true. Ils sont magnifiques ces gateaux, tout comme tes photos! Je vais les faire ce week end. Pour moi aussi Noël c’est des rituels, comme celui de te réveiller le matin pour aller chercher les cadeaux sous le sapin 🙂 je veux passer Noël avec toi! I just made these and they are so fantastic! Light, crispy and such beautiful layers with the butter as you described! Thank-you for sharing!